Rendered with creativity and thoughtfulness by the suppliers of windows at Kneer GMBH, Fenster Und Turen, this German country home celebrates the rustic beauty of timber in a unique way. 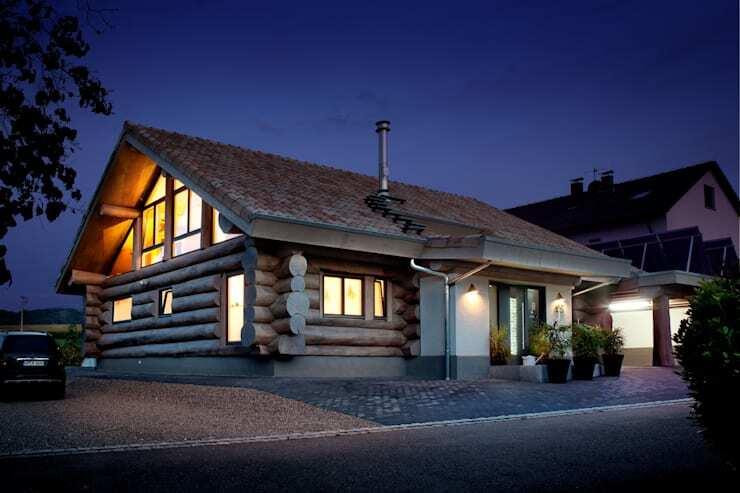 Situated in the picturesque town of Westerheim, this cottage-style residence flaunts the earthy charm of wooden logs both on the outside as well as inside. 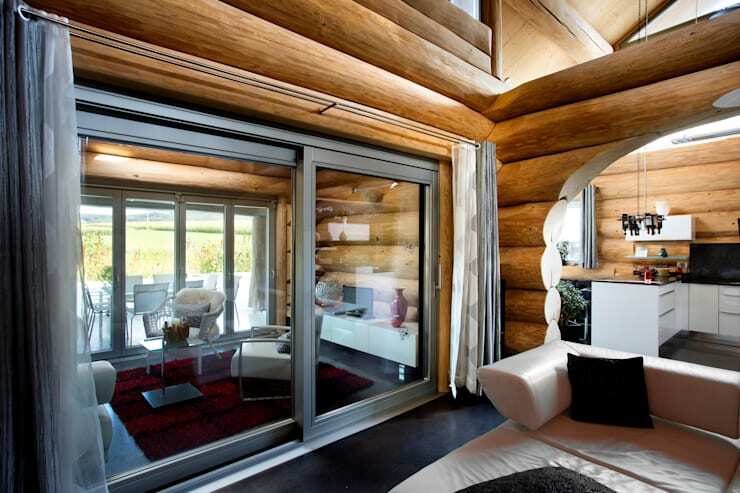 But you will be impressed at how contemporary designs have been coupled with wood in its rooms for a trendy yet countryside appeal. Though neutral hues dominate the interiors mostly, sudden pops of vibrant colours appear to delight the senses. 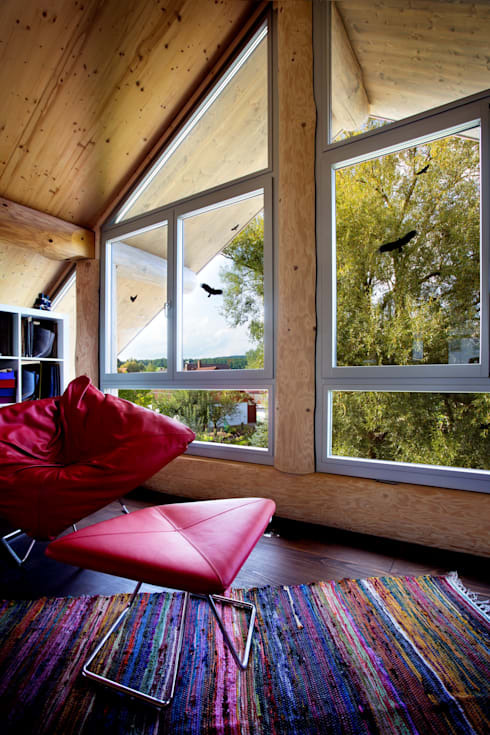 Also, the generous presence of glass windows makes it possible for the abode to receive ample doses of sunlight. Now get ready to explore this beautiful home more closely. The setting is straight out of your favourite childhood fairytale book – logs for the walls and a slanting roof that hangs low with mystery while golden light shines through the windows and the attic. This is the luxury of the imaginative and rustic design of this home. 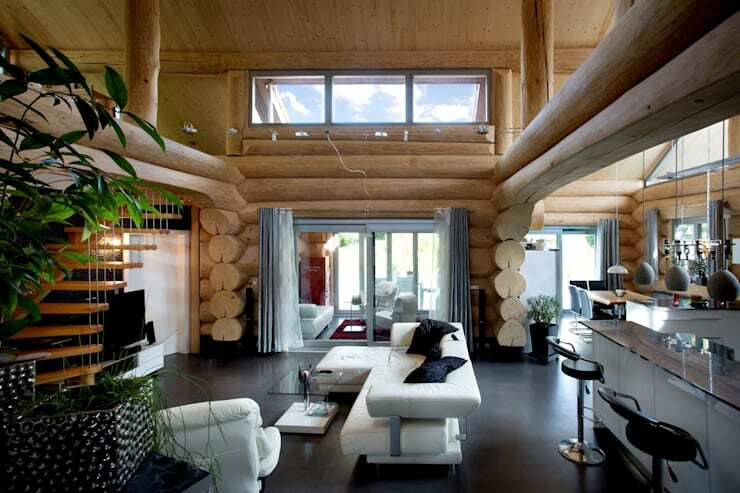 The log cabin feel has been retained indoors with the logs appearing where walls and beams should be. The main hall has been left open without the clutter of internal walls. Contemporary furniture in white sits in the centre of the living space with black cushions for stylish contrast. The bar stools on the right beckon you to enjoy a relaxing breakfast as the rest of the hall shines in the beauty of stones, woodwork and greenery. Plenty of natural light comes in thanks to the large windows on top as well as the sliding glass doors. The simple and soothing sun room has a vibrant touch thanks to the burgundy rug which dresses up the white and chrome seating as well as the white sideboard. 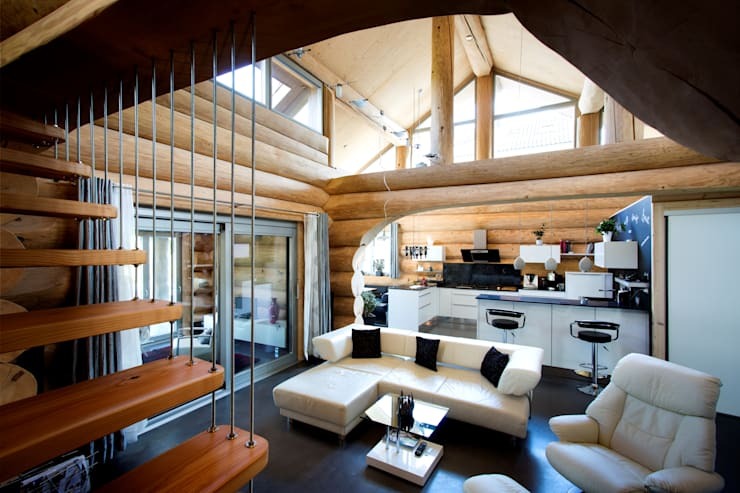 From this vantage point, you can also see the arch that has been carved out of the logs which stand between the kitchen and living room. The glass windows and doors offer a panoramic view of the surrounding area. The chrome cables act as the balustrade for the elegant staircase and hold up the sleek wooden planks or steps. A subtle sense of privacy has also been achieved thanks to this touch. From here, you can view the entire hallway spread out in its comfortable white décor and wooden surroundings. The attic upstairs features modern, structured furniture in red leather while a woven rug sits on the hardwood floor with its rustic bearings, adding much colour to the well-lit space. Natural light streams in through the massive glass windows under the slanting roof, and fills the space with positivity and happiness. The deck is a relaxing space from where you can admire the earthy shingles on the slanting roof. This deck has been done up with a few potted plants for natural relief and quaintness. Charming lighting shines down from scones placed on either side of the door and lends the home an enticing quality after the sun goes down. 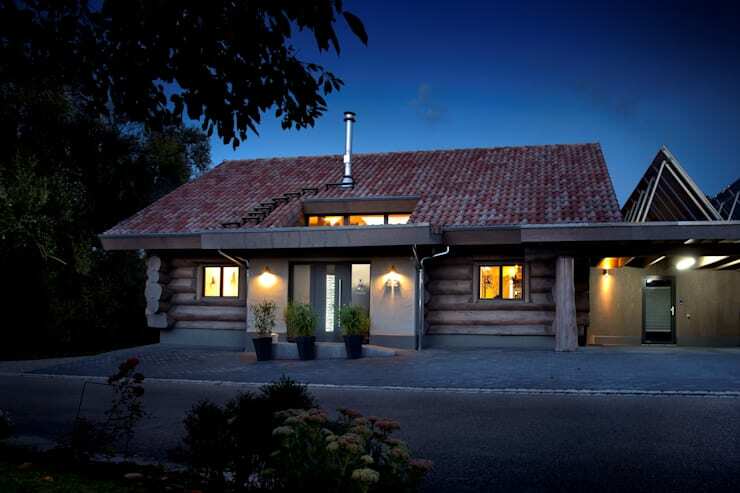 Inspired enough to build a wooden cottage of your own? We are too! Here’s another home tour that might pique your interest - The Family Home Packed with Colour.